I have never been hunting in my life, until I moved to Wyoming. My husband, Levi, took me elk hunting the first year we were married. I asked him to take me and was excited to go. Then I woke up at 4:30 a.m. to a cold drizzle. I hate being cold. The only thing worse than being cold, was being wet and cold. But I wasn’t going to let the drizzle stop me from going on my first elk hunt. I decided to dress warmly, but in layers, just in case it warmed up while we were out. “You gotta pee?” he asked. “Yep.” I must admit I was a little disgusted with myself. After all, I was at the house just 10 minutes ago. Why didn’t I go then? Levi looked up the trail, back at me and then up the trail again. I could see he didn’t want to wait for a silly female to miss getting to his good spot. I told him to go ahead and I’d catch up. So I laid the quilted shirt on the four wheeler and followed it with a sweatshirt. My T-shirt followed, I unbuttoned my jeans, pushed them down, then unbuttoned the long johns and pulled my arms out of the sleeves. I proceeded about my business. I began redressing as fast as I could because, while squatting here, it had occurred to me that I didn’t know where he was going. Levi had shown the hill to me once before, but it was summer and daylight. I walked down the trail that the cows had worn still buttoning my long johns. I started up the hill 50 feet from where we’d parked shrugging into my quilted jacket. The trail leveled off to an area about 10 feet square. The hill rose steeply to our left, there was a large pine tree to our right. The hill dropped off in front of us and was flat for 15 feet before a barbed wire fence divided the pasture we were in to the next pasture, which we also own. This time when I looked I could see the elk as if he’d had a neon sign pointed at him, even though only part of his head and one antler was visible. It still wasn’t light enough to shoot and from the hunter safety class I took I knew it wasn’t a good shot. We waited, watching that elk and then he saw us and was watching us. No doubt he was trying to figure out how he was going to get from behind that tree, across an open area to the cover of the trees covering the hills. Looking at where we were, I could see it couldn’t have been a better place if we’d designed it ourselves. We were on an oblong hill that ran from northeast to southeast. To the west of us was a steeper hill that ran north and south. From the north-south hill, a smaller hill jutted to the east, creating a bowl with flat ground between the hills. We were on a knob and the lowest part of the bowl. Elk come off the hills and go east to graze in the evening. Then, in the early morning, they come into that bowl and up the hill to spend the day in hiding. There we were in a Mexican stand-off with an elk. Then he moved to the next tree in the line. There was just enough gap between the trees to see him, but not all of him at once. Then he paused there for a minute then started trotting towards the trees. Levi had his gun up, but I wasn’t sure if he was going to shoot or wait longer. This wasn’t a hunting show where he was giving a commentary as to what he was thinking. I waited. The sudden explosion of the gun made me jump. Levi lowered his gun and stood up. I thought he’d missed, as that elk started running faster towards the tree line. Then we both saw it. The elk was limping. Levi started down the hill as fast as he could, but not towards it to the south. He was going west. I asked him where he was going and he explained that he was going to try to get in front of it to take another shot. I told him to go and not worry about me, I’d follow. As I said before, I’m from south central Nebraska. They don’t have mountains there. They don’t even have hills. I followed down off that knob, back towards the four wheeler, across the fence and up the other hill. I was going as fast as I could, but Levi was already out of sight up the hill. I pushed on and soon my heart felt like it was going to explode and my legs were rubber beneath me. I slowed down to a walk, trying to find the easiest path up, but it wasn’t helping. I was following a barbed wire fence that was the west border to the pasture we’d just crossed into and Levi was not only nowhere to be seen, I couldn’t hear him either. Soon I just sat on a large rock, resting with the idea that Levi would come back for me when he could or I’d continue in a moment. It wasn’t long before I thought I heard my name being called. Then I heard it again. I turned around and there was Levi above me. He told me to come on up. I again hurried up to him and was out of breath when I reached him. We were in a bit of a clearing and he explained to me that the elk cross here and that he was looking for some sign that the elk he’d shot had come up this way. We began looking at the ground for blood, fresh hoof marks or any other sign that he’d come up. After about three trips across the same area, and still no sign I had again come to the conclusion that Levi had missed the elk. While we were looking for signs, Levi would draw up short and ask me if I had heard that. Once he said it sounded like a twig snapping, another like rocks sliding. I hadn’t heard a thing and began to think he was one of those hunters who became so caught up in the hunt that they began hearing and seeing things that weren’t there. Levi was trying to decide what to do next. We were near a place that had two fingers of the hill pointing east, and covered in thick trees. I was for giving up the hunt. I thought he’d missed and we were supposed to be rounding up and working cows today. I suggested that Levi go to the point of one of those fingers and make a decision from there. Perhaps he’d see nothing and we could get back to the house and what we were supposed to be doing. I would wait on top in case the elk ran past, I’d call out to Levi. Levi thought this was a good idea. So while I waited on a rock he went into the trees. I sat there. By now it was quite warm and the hike up the hill combined with the walking the clearing had warmed me to overheated. I took off my quilted shirt and my tee-shirt and waited, and sat, and listened, and waited. I don’t know about you, but from time to time I have conversations with myself. Now was one of those times. You’re sitting on a rock waiting for an elk to come by. What will you do if he actually does? Throw a rock at him. You’re going to throw a rock at an injured elk? That won’t make him mad. What else are you going to do? I could yell and wave my arms. Hope he doesn’t run over me. He has antlers, you know. That could hurt. I don’t even hear Levi. I wonder where he’s at. When I heard a shot, I got up and began moving towards where I thought the sound came from. Then I heard another shot. Now I was worried. What if one of those shots wasn’t Levi’s? What if he was hurt? Then I called to Levi, but he didn’t call back. I called again and again. Finally he answered. By calling out to each other, I finally located him. I asked him if he’d gotten his elk. He took me to where the elk lay. He bent down and began hacking at its neck, close to its head, thinking that the skin wouldn’t be as thick here as further down. He stopped a couple times to sharpen his knife on a rock that was just laying there. When he was finished there wasn’t a lot of blood, so we took it by the hind legs and drug it around so that the head was lower than the rest of the body. There still wasn’t much blood and we decided it wasn’t cut properly, but that we needed a better knife. Levi took off his orange vest and draped it over a branch to help mark the spot and we left to go get more. More knives and more help dragging the elk through the trees and down off the hill. On the way back to the house, I asked him to tell his version of the hunt. He said that when he went towards the knob of the hill, he intended to have at least half an hour to set up and load the gun before he saw anything. He topped the knob and immediately saw the elk. His first thought was to load the gun. The shells were in his pocket, but he was so excited to see such a large elk that his fingers wouldn’t work and he dropped the first two shells. He squatted down to pick them up and brace his gun. That’s when I came up the hill. When we were in the clearing and he went out on the finger to see what he could see, he thought he could hear movement and he went down into the little valley between the two. That’s when he scared it up where it had been laying. He didn’t get a shot off then, but circled around to the south and west. 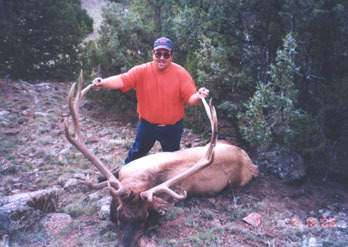 The elk and Levi came into a clearing at the same time and Levi shot him again, this time right behind the front leg. The elk went down about 10 yards from him and he went up and shot it in the head to be sure it was dead. I asked him which gun he had with him and he told me it was the .30-.30. Then I asked what he thought the distance was. He estimated it was half of a mile. We went back to the house. Because we were supposed to be working cows, we had extra people visiting. It was decided that the men would go get the elk and the women would saddle horses and start rounding up the cows. It wasn’t until later that we could get a look at the elk. The elk was a six by six, with all of the points intact. There was even some velvet on one of the tips. We took them to Nebraska to show my dad the tips were as wide as the top of my Dodge Grand Caravan. When I tell this story, I like to say that after Levi fired the gun, we sat down, made a pot of coffee and had a cup before the bullet hit the elk. We knew where the second and third shots hit, but the first shot hit the elk in the rear ankle. Which, if you stop and think about it, means that if that elk had taken one step longer or shorter than the width of his rear foot, Levi would have missed.